The installation: Le mot traduit le bruit des contingences passées [“The Word Reflects the Noise of Past Contingencies”] is based mostly on sonic concerns. Although its form and the elements used in it all point toward what should be a video installation, the work actually highlights the main feature of sound: its evanescence. Sound exists only in an instantaneous temporality. Through an attempt at playfully piecing back together a vanished sound event, the installation sets a series of ambiguous relationships between sounds and pictures, past time and present time, unique perspective and mobile perspective. 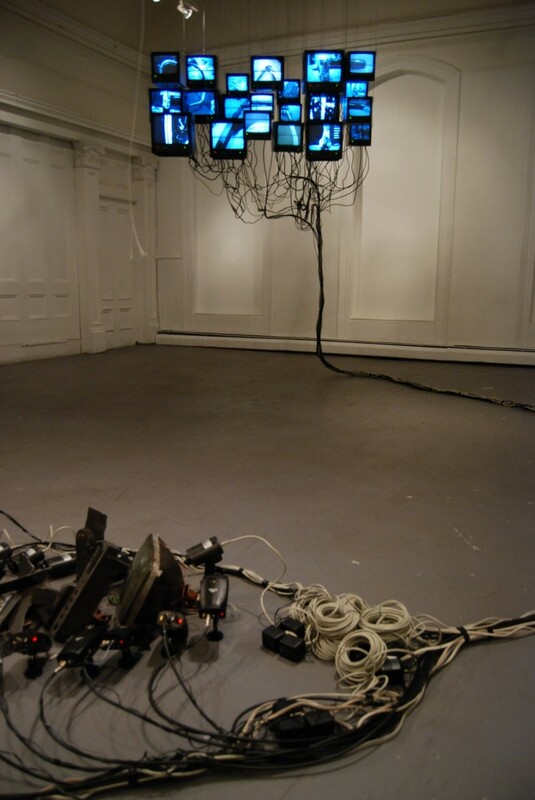 Surveillance cameras and monitors – the guards of our relationship to the present time and our fantasies of omniscience and ubiquity – spy the inanimate shards of one of their own, heavily fallen from the ceiling, taking with it the sound of a past event. Inescapably, time dissipates the clamour of the noisiest events… Lacerated matter – the sole clue of the event’s violence – contains in itself the trace of a noisy transformation of matter. Through multiple perspectives on the remains of this incident, the work makes sound reappear. The sound is not reproduced; it is suggested, implied; it is written. So the installation transforms sound into picture, pictures into word, and word into sound. Therefore, the work addresses a number of issues in relation to temporality and mobility, through a series of cognitive games and back-and-forths between moving images, real time, sound, multiple perspectives, and a single perspective. Are we in the presence of a sound work, despite the physical absence of sound?